In Malaysia, imports of cocoa beans represent 6.3% of world imports and was ranked fifth in world imports. Malaysia imported large volume of cocoa beans as the country does not produce much cocoa but is considered a large export in cocoa and chocolate products. 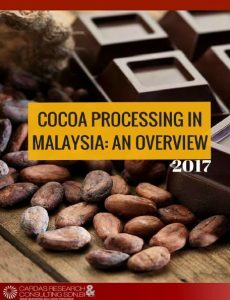 Malaysia imported cocoa beans from 25 countries in 2016. The import of cocoa beans has shown decline in 2015 and 2016 in terms of the volume and value imported. This is corresponding to the decline in cocoa grindings. As mentioned earlier, cocoa grinders reduced output in hopes that prices would improve.